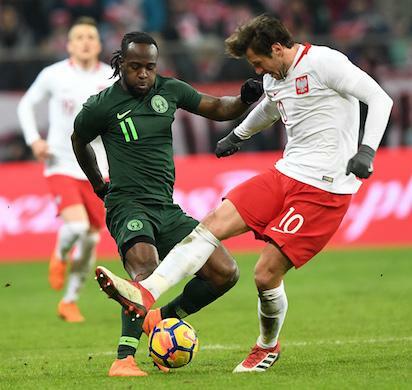 Super Eagles striker, Victor Moses said his penalty goal against Poland in Friday’s international friendly was well deserved, while his Polish counterpart Robert Lewandowski believes it was a phantom penalty award. Moses had dribbled his way into Poles penalty box in the 61st minute and an extended leg by Marcin Kaminski. obstructed his advance towards goal. “For sure it was a penalty when I was fouled, the referee made the right decision. It was a good win for us,” Victor Moses said at the mixed zone. “Poland has many good players. They attacked especially well after conceding the goal, but we showed more character today. Lewandowski said that referee Michael Oliver made a mistake in awarding the kick. “I think that Nigeria did not create too many chances. It was the penalty incident, which probably was not. The post Moses, Lewandowski disagree on Eagles’ goal appeared first on Vanguard News.